State workers who are members of the AFSCME union will be given a chance to ratify an “understanding” that would see about 20,000 state workers take five unpaid days off over the next seven months. 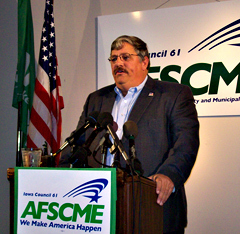 The move not only would save nearly $23 million in state worker salaries, it would help save the jobs of 479 members of the AFSCME union according to AFSCME Council 61 president Danny Homan. Homan called the proposed deal a “Memorandum of Understanding” and he said it would save AFSCME jobs throughout the executive branch, not just in the Departments of Corrections and Public Safety. Not only will there be five of what Homan and others have begun calling MUD — Mandatory Unpaid Days, state workers would agree to forgo the state’s contribution to their IPERS pension funds for the remainder of the state fiscal year. “In this uncertain economy, these measures were necessary,” Homan said, reading from a prepared statement. Dues-paying AFSCME members who are part of the state workforce will vote between November 19 and 25th on the deal. Homan argues as legislators and the governor consider cuts in next year’s budget that a tax increase or an end to some tax breaks be considered as options. Homan openly admitted his frustration during this afternoon’s news conference.